I just finished reading Yesteryear, The Next Generation, and wanted to let you know what a special book it is. I found it humorous and a compelling read with insights and guidance into wildlife and outdoor sports, faith, and family relationships. The life experience reflected in the book shows how one man grows from youth to retirement and how reflection on family, career, and friendship reveals where the true blessings of life lie. Named by Amazon #1 one new release in the Business Ethics category. 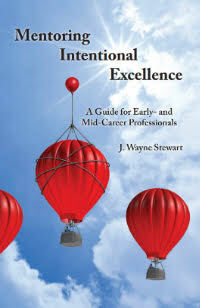 Mentoring Intentional Excellence is a book on mentoring for success, and author Wayne Stewart uses an effective format of real-life experiences to mentor the reader in lessons-learned from a 45-year career in technology and entrepreneurial ventures. Part 1 is titled The Stories, relating the experiences and resulting lessons-learned, not chronologically, but topically. Part 2 is titled The Lessons, describing instructively a lifetime of management success factors. Throughout, Stewart inserts pithy and interesting sidebars, some of which are included below. In Part 1, The Stories, Stewart mentors the reader one-on-one to help him/her through a lifetime of key decisions that collectively define the success (or failure) of a career. Stewart begins with a chapter entitled Intentional Beginnings, and then moves through chapters such as Battling the Octopus, Dancing With Your People, Negotiating As An Artform, Dealing With Big Personalities, and Intentional Quality. The meaty stories deal with the major questions that professionals, managers, and executives are confronted with, describing his own ethical, leadership, and human relations challenges and responses. Some are humorous, some painful, and some are even tragic and deadly. He describes the intentional decisions that every person must make that determine their behavior and character. He argues that those decisions should never be made by others with stronger personalities; rather they must be made personally and intentionally. At times he reveals conscious decisions he made in his career that changed its course and, in some cases, his life. Those kinds of decisions define what others know about you, as you live them out, and as others recognize and come to trust you consistently to be that person. At times, bullies and corporate politics come on the scene, and Stewart consistently stands up for the customer, dealing with bloated corporate bureaucracies that interfere with the organization’s focus on the customer. In Part 2, The Lessons, Stewart briefs his readers as though he’s leading a conference on the success factors of the business world. Chapters titled The Management Punch List, The Stewart Theory of Change Management, Mentoring the Next Generation, and Losing Your Job are among those that wrap the lessons-learned of Part 1 into a Management Philosophy that was successful for Stewart. Wayne Stewart was successful at writing an engaging and interesting book on a life well-worked and well-lived. While the title says it’s a guide for early- and mid-career professionals, I would recommend it to all stages and levels of a career. Wayne Stewart is a native Texan and a graduate of the University of Texas. He began his professional career at Texas Instruments in 1973, rising through the managerial ranks to lead large Defense Operations. After 21 years, he moved to executive positions with FSI International and ADC Telecommunications, and following the Telecom meltdown of 2001, he went out on his own, opening consulting, franchising, and ranching businesses. In 2007, he was invited back to the corporate world where he finished his corporate career as an executive at Schneider Electric. After retiring in 2013, Wayne took up writing and ranching full-time, and he recently opened a publishing business to handle publication and distribution of his books and his consulting business as he’s asked to deliver the lessons of Mentoring Intentional Excellence in first person. 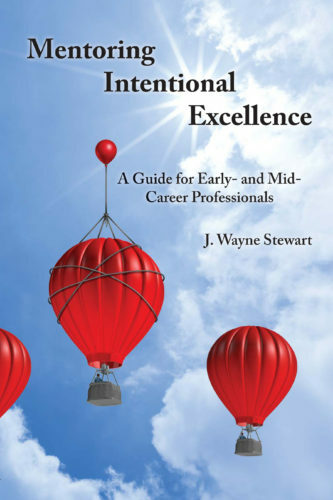 Wayne’s newest book, Mentoring Intentional Excellence, A Career Guide for Early- and Mid-Career Professionals, was launched June 15, and it’s already number 1 new release in Amazon’s Business Ethics category. Available thru this site or Amazon. Our site’s up and running, and we’re officially in the publishing business! Mostly we’ve been writers who have published our own books for family consumption, but since the Civil War diary of my great, great grandfather, Captain Francis Asbury Vaughan (Union) went on display at the Bullock Texas State History Museum, we’ve been getting a lot of interest in the story of this family. Having two books published and three more in various stages of writing/publishing, we decided to launch SGR Publishing, to formally offer the stories to a broader audience. And then there will be the “Yesteryears” of future generations. Please let us hear from you at wayne@sgrpublishing.com or through the “Contact Us” feature here on the website.